Several of the most important factors needed for plant survival are very dependent upon extremely complex back and forth, multi-layered communication – these include the use of vital plant communication with bacteria and fungus. What is a symbiosis–two forces approaching and each learning the signaling language for the other? Plants determine friends and foes from a wide range of microbes and fungus, and then encourage the relationships with symbionts and fight against the intrusion of pathogens. Plant communication with fungal wires is almost ubiquitous. Plants are extremely sensitive and interactive, constantly gathering information from the environment both deep in the soil and in the air. This is then communicated to other plants, such as signaling the arrival of predators through chemical signals in the air. Plants’ senses include chemical and mechanical contact, light, smell, and possibly sound and magnetism (see post). Internal communication in plants includes water pressure, chemical signaling and electrical signals. Plants have been noted to use fungal wires for communication with other plants, including information and nutrients. When stressed, plants use these wires to alert others to problems. One of the most important and complex communication occurs with microbes and fungus for nitrogen fixation. Microbes demonstrate complex communication and decision making, among colony members and other species. They produce protein electrical wires, (made of conducting aromatic amino acids phenylalanine, tryptophan, histidine, tyrosine.) supplying distant colonies with electrons. Microbes send signals triggering changes of other microbes’ behavior, including building elaborate city-like slime molds. Slime molds themselves have recently demonstrated intelligent behavior, exploring using previous knowledge of their travels. Individual microbes also remember how they have moved, turning appropriately in order to move in a straight line. Bacteria in the gut can plan for the future, turning on genes to digest maltose, which they will encounter further along. 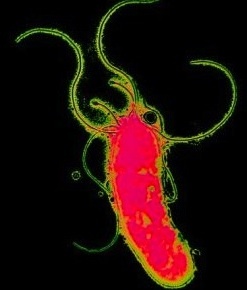 Microbes use a complex set of signals. One encourages others to move in a different direction to find food. Another launches attacks when enough members are present. Some affect the complex behavior of animals. They send messages consisting of genetic material, and have elaborate communication with human cells. One of the most complex back and forth communications of microbes is with plants for the all important nitrogen fixation, which the plant cannot have without this process. Fungi have even more elaborate relationships with plants. Previous posts described widespread fungal wires, sending messages and important nutrients throughout the plant kingdom. When stressed, plants signal along these wires and other plants respond with changes in preparation for stress, drought, and predators. Nitrogen, along with carbon, oxygen, and hydrogen, is a critical element in any cell. Nitrogen forms amino acids for proteins and nucleotides for DNA and RNA. Since nitrogen in the atmosphere, N2, is inert it must be changed into useable forms such NH3, ammonia, NO2, nitrite, or NO3, nitrate. 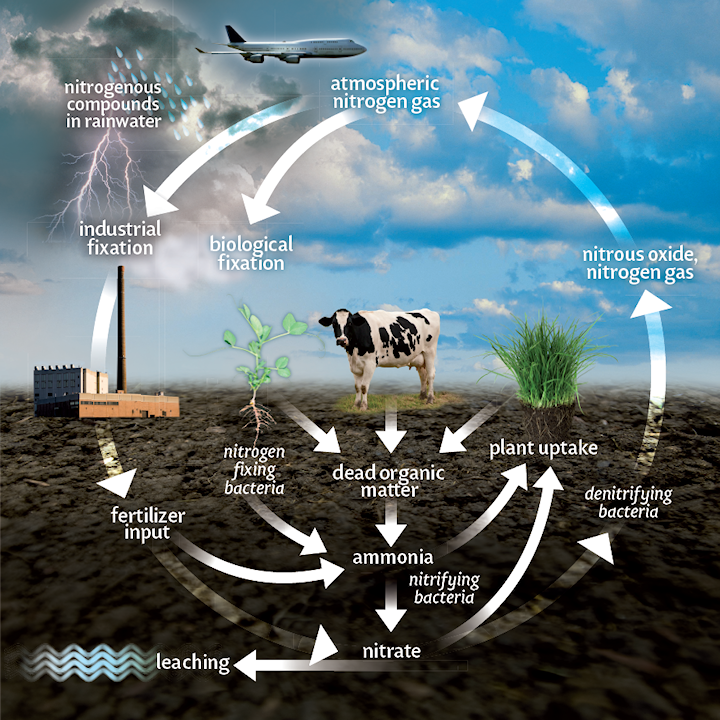 Nitrogen fixation, the chemical process of transforming N2 nitrogen into active forms for plant use, occurs naturally in several important ways, such as by lightning and volcanoes. Another is by microbes and fungus fixation. Nitrogen is a major ingredient in fertilizers. A major bacteria that symbiotically fixes nitrogen is rhizobia. Among fungus a major symbiont is arbuscular mycorrhizal fungi, or AMF for short. The rhizobia bacteria form a very elaborate structure called the nodule, and the fungi, enter specific plant cells, establishing a set of wires for communication through these cells. These processes occur in the rhizosphere, the narrow region of soil that is directly influenced by root secretions. Bacteria have a business relationship with plants. They capture nutrients that plant needs, then negotiate to give these nutrients in exchange for photosynthesis-derived carbon. 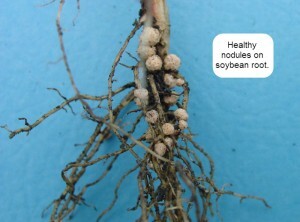 The plant and rhizobia bacteria form nodules on the root, a structure used to prevent the free flow of oxygen in order to efficiently fix nitrogen. Rhizobium is a common bacterium in the soil that is attracted to roots of bean plants and starts an infection process. The root hair cell is the conduit for the infection. The plant sends specific flavonoid signals from the root or seed. The bacteria recognize this signal, which triggers genes to make enzymes to synthesize a special signal molecule, nod factor. This signal, even at extremely low concentrations, is recognized by special receptors in the plant, which triggers the actions that create the symbiosis. 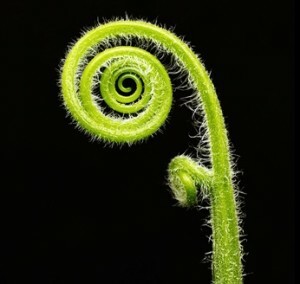 The symbiosis starts with the plant creating a pocket in which the bacteria multiply by the curling of a root hair. Bacteria first gain entry through a pathway created by the root hair membrane. Mutually, bacteria and the plant form an “infection thread”. This infection thread grows into the root hair and eventually enters the root cortex where it multiplies. Surprisingly, before the thread reaches its destination (heading for a specific cell that is signaling,) the genes of the plant trigger new cells to grow to prepare for the creation of the new nodule structure. The bacteria enter the particular infected cell, that was sending signals, through the release of vesicles and multiply there. Then the plant builds a special membrane around this region, which is called the “symbiosome.” The symbiosome is the factory, which fixes nitrogen for the plant. What is very unusual is that the symbiosome is actually a plant created organ with specific cells that fix the nitrogen and then surrounding cells with a different function of taking the nitrogen and passing it along. The plant receives an abundant supply of hard-to-get nitrogen, and the bacteria has a steady supply of carbon food. Over years the bacteria multiply into a very large colony. This very complex process has many different levels of handshakes. This review will mention just a small part of the vast complexity involved in the communication between the bean plant and the colony of bacteria. A similar process occurs with fungus, where smaller structures fix nitrogen. Fungus can establish these communications with 80% of the plant species, including many of the most important food crops such as cereals, fruits and vegetables. A recent study showed that fungi, not plant matter, sequester most carbon. Fungus fixation is done inside of cells, not in a large nodule structure. In this infestation the fungus invade plant roots and set up arbuscules, small structures for nitrogen fixation and mediation of nutrient flow, in root cells. AMF fungi form these small microscopic colonies in root cells. In this process the plant sends the signal, strigalactones, as the first communication, and then receives the return signals from the fungus. Hypha, fungal branches, contact the root and enter the root through the epidermis. Once inside the plant the fungus grows branches, the arbuscules. 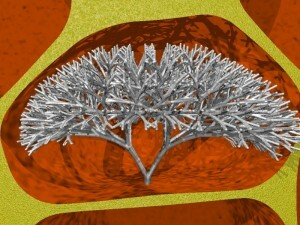 These branching structures form small factories to produce nitrogen. The plant makes major modifications of the cells to facilitate the arbuscules. Fungal hyphae roots grow to the outside of the plant to absorb phorphorus and other nutrients. Nutrients then go back and forth as well as supplies of nitrogen to the plant. There is great complexity with multiple signals back and forth, as well as many new behaviors from the plant to facilitate the infestation. This is only done when the plant is certain that these are friends. In fact, the plant can cancel the entire enterprise at hundreds of different points in the process. In this post there is only room to describe a small number of the interactions and give a flavor as to how intelligent and complex these processes are. The symbiotic receptors are one example, as is the creation of calcium oscillations in cells (a signal from the nucleus for the bacteria or fungus to approach). Both use very complex second messenger cascades from receptors on the plant membrane down into the nucleus where the calcium oscillations are a critical part of the process. Each individual plant sets up its own new communication with microbes in the rhizosphere the area of soil near the root that is influenced by secretions from the root. The original signals are not simple, but include many variant molecules with different side chains. These include methyl, acetyl and sulphate groups each with specific meanings for the rhizobia and the plant. If either the bacteria or the bean plant are defective in these factors, no communication occurs. After initial signaling at the outer membrane level, internal signaling pathways in the plant reach the nucleus stimulating the phenomenon called calcium oscillations. This unusual nuclear oscillation first occurs in the outermost plant epidermal cells where the microbes will enter. This same nuclear cellular oscillation signals then occurs in other plant cortical cells where bacteria will eventually colonize, providing a pathway for the invader. When triggered, the calcium oscillation prepares the cells for the symbiotic infection. As the microbes travel from root hair cells through the “root hair curl”, and infection threads into the large nodule, it travels through specially created cortical plant cells in the nodule. The new cells are produced before the microbes arrive. The plant facilitates the movement of the bacteria with special cytoskeletal structures made out of microtubules, actin and endoplasmic reticulum (the part of the cell where metabolic and protein synthesis occurs near the nucleus). Once inside the nodule, the bacteria either stays inside these infection thread structures or separates going into individual cells. During this entire complex process signaling occurs in both directions, and the plant builds new structures in anticipation of the later events in building the nodule. After entering the plant, the hypha of the fungus sends out a hyphopodium, which grows into the root epidermal cell. The plant has already prepared specialized regions for the fungal invasion (different than the preparation for bacteria), using clusters of cytoskeleton and endoplasmic reticulum, just below where the fungus is entering the plant. As in the bacterial process it is the calcium oscillations that show where the fungus should enter and the path to travel to other cells. This hypha grows inside the plant and then goes into the plant root corticol cells where it forms structures called arbuscules. Both the bacterial and fungal nitrogen fixation processes involve hundreds of stages, which can fail at any time without accurate signaling. Before the calcium oscillations there are many steps and afterward many more. 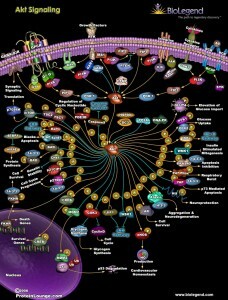 To avoid too much confusion, this post will only discuss a small part of the complexity — kinase signaling, calcium oscillations, receptor complexity and genetic signaling. Kinases and phosphatases are enzymes that transfer phosphorus groups. They are two of the largest classes of proteins on earth and are critical in signaling cascades in many cellular processes. The genes in beans that recognize all the different nod factors and fungal myc factors encoding specific kinases with receptors on the membranes. These bind specific oligosaccharides that are also part of the fungal cells walls and bacterial cell envelopes. These signals then cascade down to the nucleus where the calcium oscillations are triggered. Interestingly, bacterial and fungal processes use similar cascades of molecules to regulate calcium channels, critical for nuclear calcium oscillations. 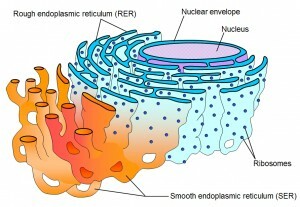 Much of the unique symbiosis for bacterial and fungal activity occurs in the nucleus of the cells. Calcium oscillations need three mechanisms for rising and falling levels of calcium in the nucleus. These involve channels at the outer membrane and at the nuclear membrane as well as a flow of calcium from the endoplasmic reticulum. 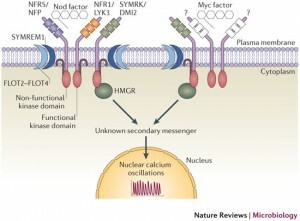 Calcium channels allow flow of calcium from endoplasmic reticulum and nuclear membrane to the nucleus. Calcium pumps and specialized proteins in the membrane, called symporters, pump the calcium back out. Another channel is necessary for counter ion balance. A well-known example of counter-balance occurs in the axon’s electrical signal. To balance sodium influx potassium rushes out, each with their own unique channels. A similar process occurs with nuclear calcium oscillations. The calcium oscillations occur in the cortical plant cells preceding colonization by either the bacteria or the fungus showing the planned path of the infection. Neighboring cells to the invasion also respond at first by having low level calcium oscillations, and then greater oscillations as the actual invasion starts, providing a pathway and welcoming party. Perception of the calcium oscillations requires another set of kinases in the nucleus. If this nuclear kinase is activated then symbiotic relations are activated. It appears the sole purpose of the calcium fluctuations is to activate this kinase. Activation changes the shape of the kinase and occurs by binding calcium in two ways – either with the kinase or with a structure right next to it that appears to be involved in regulating this process. Bacterial and fungal activation of the symbiosis use similar molecular pathways such as cascades to the nucleus and calcium oscillations. But, in the nucleus the two processes are different. The plant has to recognize whether the bacterial or fungus process is occurring and then specifically stimulate the correct genes to make either the nodules or the fungal intracellular infection. Factors work with DNA promotors to stimulate specific genes. Different factors influence the genes in different stages of the building of the nodule or the arbuscule. The fungal process uses other factors promoting hyphopodia formation. Genetic links have feedback loops activating, regulating and terminating either the bacterial or fungal response. The fungal mechanisms are ancient and occur in the earliest fossils of land plants from 450 million years ago. The more complex bacterial nodulation occurred later using and building upon parts of the fungal signaling process. Some bacteria have similar kinases to the plants, but the specific signaling kinase for this process is unique to plants. Evolutionary piggybacking occurred with DNA promotors, cascade signaling to the nucleus and calcium oscillations, and a later exocytosis process. Each part of this immense complex mechanism has elaborate back and forth communication – initial signaling, initial response, creation of calcium signaling, multiple kinase activations, genetic regulation, and building of very complex nodules and arbuscules. Somehow, the plants and microbes understand every detail of this process and can send signals either to continue the process, or stop it. Importantly, this entire process is critical for the survival of the plants. It involves hundreds of different signals any one of which, if defective, could terminate the entire enterprise. How can anyone say this is not an intelligent process? Gabriel Ionita has published idea. Ioan Carciu, Antonio Franco, and Iriya Tyuni like this.